When do you add your project manager? This is really about project management, trust me. Well I didn’t remember, but I hadn’t been put on the project until a week after the plan of record. Bob’s face showed no small amount of confusion as well. Jake, sensing the confusion explained. Making sure you can internationalize your software is a classic example of planning ahead to save yourself a lot of re-work down the road. If you don’t make your code double byte compliant, you can end up having to re-architect from the ground on up. What could be a little extra work, during development, can require a complete disassembly of the car, just to put a missing screw into the middle of the engine. Remember how big an issue it was to fix all those Y2K computers that had two digit years and needed four digit years? Same concept. I18N also gives us a great example of “how hard can it be?” Making your software work in another country can be a very complicated and convoluted process (Check out the scope section of the Wikipedia entry on I18N). It is easy to just brush it off as changing the language on the screen, when in reality making your product work in another country can be an entire product of its own. The PMBoK asserts it should be in the project initiation phase. Reality, however, can be a lot different. This is one of those times when I unequivocally side with the PMBoK. There is a measurable part of society that sees project management as little more than a schedule tracker and meeting holder. This perception places project managers in a non-essential role. If you have one, that’s great. But if you don’t, just have the development manager, civil engineer, etc. do it in his spare time. It’s an add on, not a full time job. Not everyone sees it that way, and the last ten years have seen this belief drop off considerably. However, that does not make it all a bed of roses. Even when project management is seen as a vital function of a project, the question of “when” remains a troubling little conundrum. Most start ups don’t have dedicated project managers. The general style of a start up calls for jack of all trade employees that can do many different jobs. Particularly in software you hear things like “we’re moving to fast,” or “we need to be super flexible right now.” At some point a successful start up has to cross the chasm from start up to predictable business. Smart start ups hire a project manager at this point. They recognize things are changing and they make an effort to take control of that change. I’ve seen far more start ups that don’t. It is not until deliverables start dropping left and right, commitments are not made and half the company doesn’t know what the other half is doing, that they bring in a project manager. By this point, things are so bad that PM is going to spend most of his time in fire fighting mode, fixing the problem of the hour and not making sure the company can execute the entire project. Similar things happen in many big companies. A product has been fully mapped out, resources assigned, a schedule created (usually based on the desire for a ship date, not realistic estimates), before a project manager is assigned to “manage” the project. The poor PM isn’t managing the project, he’s one step ahead of the avalanche trying to steer it away from the sleepy alpine village. Great organizations recognize that figuring our how to do things right, to start with, can save much more time in the long run. The “myth” that one hour of planning can save eight hours of work, has been proven true time and again. Great organizations recognize that you should get the experts on running a project involved from the get go. Project management reaches all the way back into even the wild idea stage. Whether you call it project management, program management or portfolio management, having someone who understands how to get a project from A to Z involved from the start can help to expose issues early and ensure everything that is needed is ready, when it is needed. In a recent project I served as facilitator to the product management and product architects. The product wasn’t even an official project yet, but they knew that in order to be approved as a official project, they needed to treat it like it was real. The output from that meeting went on to become the official specifications for the product. I’ve also worked in a company where I sat in the strategic roadmap meetings. These meetings would be planning out releases that were no more than ideas on PowerPoint slide. What’s the magic bullet to convince a manager, organization, company that they need project/program resources from the beginning? Unfortunately, like so much of project management, there is no silver bullet. I’ve used the internationalization example to good effect. Another that works well in, concert with Agile, is the GPS example, “Do you turn your GPS on when you start driving or when you think you should be there?” I’ve tackled this subject, from other angles, in my “Gorilla with too many hats” and “Project Managers are SMEs” blogs. As always, relationships matter a lot. You can’t force process or a project manager down someone’s throat. But develop a good relationship, and like Archimedes and his lever, you can move the world. The biggest thing we can all do, is be successful in early project engagements. Industries learn, and if enough projects are improved through early project management involvement, then that it will become more common. You might not always be able to get in on the ground floor of a project (or start up), but at the very least you can be aware of the additional pitfalls you’re going to be facing. The mountain of books threatened to collapse the desk. Cubicle desks were just not designed to support the weight of so many books. Though I suppose the gorilla was the real issue. “Hagarth?” I didn’t really need to finish the question, he knew what I was about to say. Hogarth was already bustling away to clean my cubicle as he asked the question. Without really any conscious thought I responded, telling him about the frustrating meeting I’d just gotten out of. I have owned 7 Habits for at least ten years. In all that time I don’t think I ever made it past the introduction. It took Audible.com for me to finally take the time to listen to this book on being effective (No, the irony of my total ineffectiveness in reading a book I already owned is not lost on me. ). I purchased the unabridged audio book, in all its twelve hours and fifty eight minutes of glory. As I listened to Mr. Covey read his own words, I repeatedly chastised myself for taking so long to do so. While the book and Mr. Covey’s exact words were new to me, so much of the 7 Habits resonates with my own personal philosophies and project management styles. Mr. Covey read the book personally and I think this added a lot more to the book. So many of the stories are directly personal that for someone else to read it, the book would lose a lot of credibility. And Mr. Covey’s personal anecdotes are a vital part of the success of this book. This isn’t just some self-help theory being preached by a consultant. The 7 habits are something developed through Mr. Covey’s personal life experiences. The sheer power of example on perspective is strong all by itself. Having the man who personally witnessed the events tell the story makes for an impact you just can’t measure. The seven habits themselves are not something profound or earth shattering. Instead, I would place them into the pantheon of common sense. And we all know how much we humans manage to use common sense. His concept of task management (Part of Habit 3: Put First Things First) makes complete sense and is so easily put into practice. I had a business colleague complain about how his team was constantly behind the eight ball and they just couldn’t get far enough ahead of the fires to plan. He’d never read 7 Habits, but I described Mr. Covey’s two by two Importance/Urgency matrix to him in a couple of paragraph email. A month later he told me they’d been using this for task prioritization and it had done wonders. By taking a little time, they’d discovered a lot of the fires were urgent, but not important. The book is a dense read (or listen) to get through. It’s not the kind of book you polish off on an airplane ride. There is so much data and thought provoking stories that you have to set the book aside to process it all (or turn off the recording in my case). It is the kind of book that you should finish. There were a couple of times where I had the urge to push it to the side (Heck, I didn’t read the print copy for ten years). The urge was driven completely by my own discomfort in facing my own decisions and how I’d approached problems in the past. My largest regret with this book is I didn’t read it ten years ago. This book may be twenty-two years old, but the words are still as relevant today as the day Mr. Covey first wrote them down. Where does it go on my “Book Shelf Index”? The print copy is on an upper shelf in my home office. I won’t be reaching for it every day, but that more has to do with my having copied the 7 habits down and putting them in my computer where I can reference them daily. 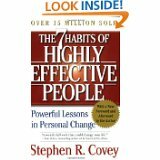 Buy the book and the audio, this is a book worth hearing read by Covey and having for reference.